Citation: Prasanalakshmi,B., & Kannammal,A. (2013). Honey Bee Behavior Inspired Particle Swarm Optimization Technique for Adaptive Resource Allocation. 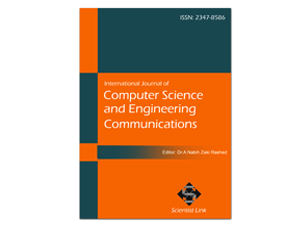 International Journal of Computer Science and Engineering Communications,Vol.1,Issue.1,pp.47-53. Cloud computing is one of the rapidly improving technologies. It provides scalable resources needed for the applications hosted on it. As cloud-based services become more dynamic, resource provisioning becomes more challenging. The QoS constrained resource allocation problem is considered in this paper, in which customers are willing to host their applications on the provider’s cloud with a given MA requirements for performance such as throughput and response time. Since, the data centers hosting the applications consume huge amounts of energy and cause huge operational costs, solutions that reduce energy consumption as well as operational costs are gaining importance. In this work, we propose an energy efficient mechanism that allocates the cloud resources to the applications using HBF-PSO framework. Keywords:Resource Allocation, Ant colony framework, Cloud computing, Intelligent Agents component. Pham DT, Ghanbarzadeh A, Koc E, Otri S, Rahim S and Zaidi M. The Bees Algorithm. Technical Note, Manufacturing Engineering Centre, Cardiff University, UK, 2005. Dorigo M and Stützle T. Bee Colony Optimization. MIT Press, Cambridge, 2004. Goldberg DE. Genetic Algorithms in Search, Optimization and Machine Learning. Reading: Addison-Wesley Longman, 1989. Eberhart, R., Y. Shi, and J. Kennedy, Swarm Intelligence. Morgan Kaufmann, San Francisco, 2001. Martin Randles, Enas Odat, David Lamb, Osama Abu- Rahmeh and A. Taleb-Bendiab, ”A Comparative Experiment in Distributed Load Balancing”, 2009 Second International Conference on Developments in eSystems Engineering. Mathur M, Karale SB, Priye S, Jayaraman VK and Kulkarni BD. Bee Colony Approach to Continuous Function Optimization. Ind. Eng. Chem. Res. 39(10) (2000) 3814-3822. Von Frisch K. Bees: Their Vision, Chemical Senses and Language. (Revised edn) Cornell University Press, N.Y., Ithaca, 1976. Seeley TD. The Wisdom of the Hive: The Social Physiology of Honey Bee Colonies. Massachusetts: Harvard University Press, Cambridge, 1996. Bonabeau E, Dorigo M, and Theraulaz G. Swarm Intelligence: from Natural to Artificial Systems.Oxford University Press, New York, 1999. Camazine S, Deneubourg J, Franks NR, Sneyd J, Theraula G and Bonabeau E. Self-Organization in Biological Systems. Princeton: Princeton University Press, 2003. “http://aws.amazon.com/ec2/,” accessed on Nov 23, 2010. “http://www.lesswatts.org/projects/powertop/,” accessed on Jan 25, 2011. A.-C. Orgerie, L. Lefevre, and J.-P. Gelas, “Demystifying energy consumption in grids and clouds,” in Green Computing Conference, 2010. “http://www.cloudbus.org/cloudsim/,” accessed on Jan 13, 2011.